The Blue Planet Aquarium is a marine and freshwater aquarium located by the Cheshire Oaks retail and leisure complex in Ellesmere Port, Cheshire, England. Machine 2 located to the right as you go through the tills. 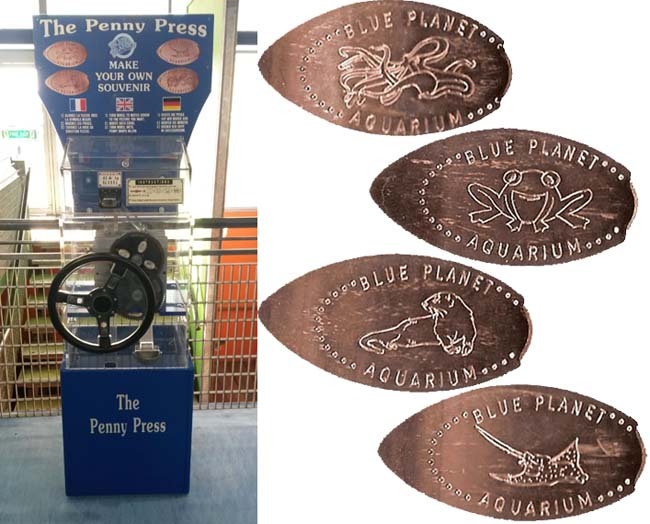 The coin designs are: Each coin has a dotted border and the capitalized text, Blue Planet Aquarium. 4) My Lucky Penny (vertical). Machine 4: The Penny Press is down the steps as you pass through the entrance. It is branded EuroPress. Each penny costs the normal £1 and has Blue Planet in text within the dotted border. thegillion added Blue Planet Aquarium to system.